Volunteering requires one to put forward their time and life skills, freely, which often stems from the desire to help a certain cause. People volunteer for varied reasons, however there are probably a few reasons that are very consistent. It could be said that a lot of people volunteer to give something back to the community, which they will find rewarding and can be seen as a personal challenge, to try and make a difference. Working with a charity, even if it’s just for the day, can be a huge gain to those who you are helping. Volunteering enables one to embark on a new project that can benefit a large amount of people. These individuals are often greatly appreciated and valued by charities, and can supply one with the opportunity to meet new people. Charity work can be highly beneficial; offers the chance to build on social skills, and supply you with an open mind and might encourage you to be benevolent in other work. Award winning marketing agency, GottaBe!, takes great pride in actively working with the community and sees it as very important to support charities, especially locally. The hard working GottaBe! team are eager to get directly involved with local charities by helping to raise the charity awareness and generally working alongside charities to give as much help as they can. GottaBe!’s 20 year old Account Support Executive, Jakub Frebel, keenly set out to volunteer at a local charity: The Boaz Project- ‘Boaz’ is the name of a benevolent farmer taken from the Old Testament. The GottaBe! employee wanted to show how passionate he is about giving back to the community and also show how volunteering can make a great, positive impact to many. The Boaz project is a Christian ethos charity, situated in the heart of the English country side, at Hill Farm, Sutton Scotney- just outside the City of Winchester. The project was set up in 2007 with the passionate aim of providing rewarding and necessary facilities for people with learning difficulties who are no longer in education. Boaz is run by a group of dedicated staff and volunteers, including manager Mike and deputy manager Sally. The project provides its members with variety of fun and educational activities; helping them to socialise and be active. These activities help the members to be valued and provides them with a happy, supportive environment. The activities vary from cooking delicious food; being creative with woodwork or arts & crafts; getting green fingers in the farms green house and allotments, and looking after Hill Farms collection of animals. 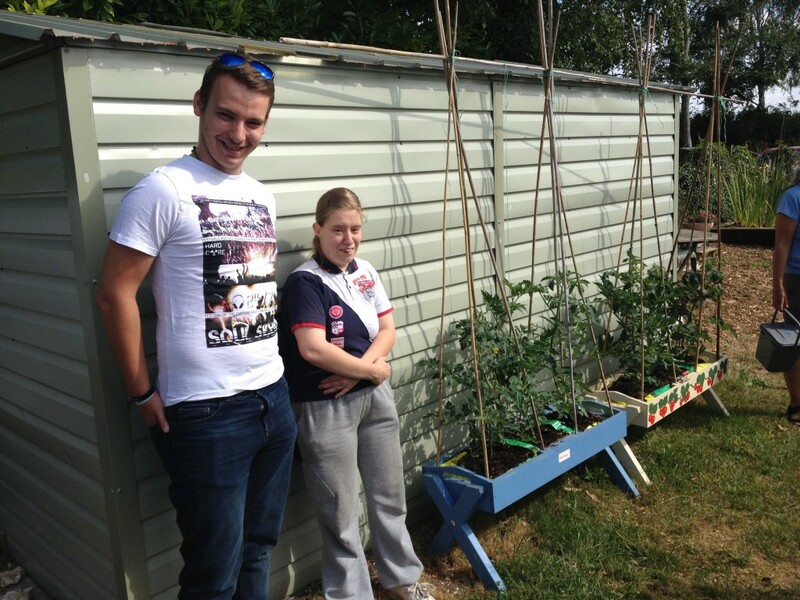 Boaz were happy to give Jakub the chance to come and help out at the project and see what it’s all about. Jakub was welcomed warmly by the Boaz team, and was shown around the project (farm) by member, Katie. The majority of the day Jakub was set to the task of helping the members make things out of wood, in the centre’s woodwork room. The GottaBe! volunteer commented- “ The most enjoyable part about working at Boaz was interacting with people with needs and providing them with the opportunities to learn new skills.” Further adding- “I’ve learned that people don’t realise how fortunate they are until they see the difficulties that others go through on a daily basis. In addition, I’ve learned that volunteering gives you a sense of accomplishment, which is a better reward than money itself”. Assistant manager, Liz, who has worked with the project for 5 years now, commented: “Boaz is good because it provides members with work related skills; supplying them with a taste of real working life and demonstrates equality amongst everyone”. Additionally adding: “Being a part of Boaz is highly rewarding because you get to interact with everyone and as time goes by you see great improvements in the members”.